Why The Sandy Hook Lawsuits Against the Firearms Industry Will Fail. 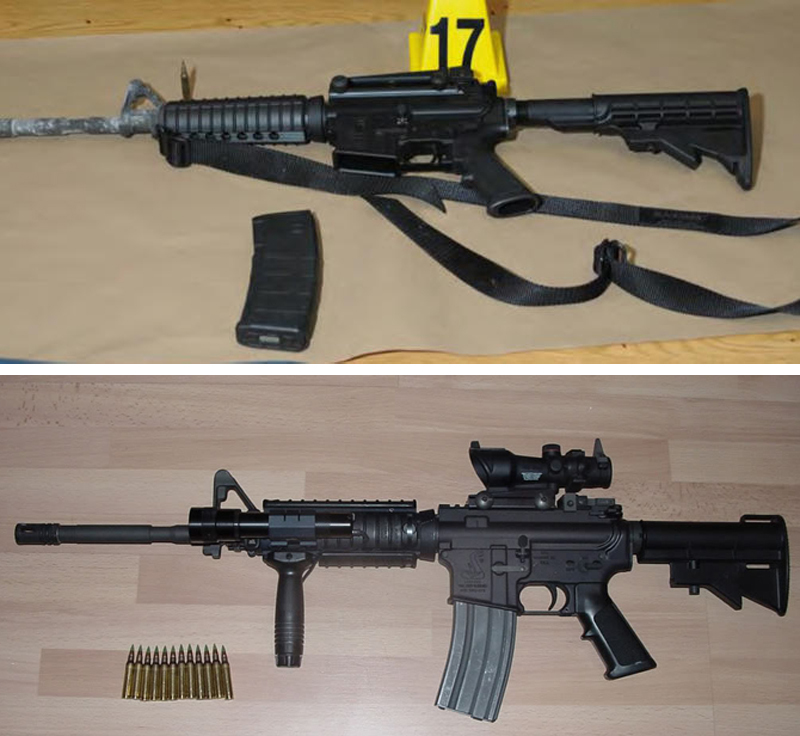 Top: The semi-automatic sporting rifle possessed by Adam Lanza at the Sandy Hook Shooting. Bottom: An automatic M4 assault rifle used by the U.S. military and heavily regulated for public sale. Nine families who lost children in the 2012 shooting at Sandy Hook Elementary School have filed a lawsuit against Bushmaster Firearms, the company that manufactured one of the weapons in possession of shooter Adam Lanza. 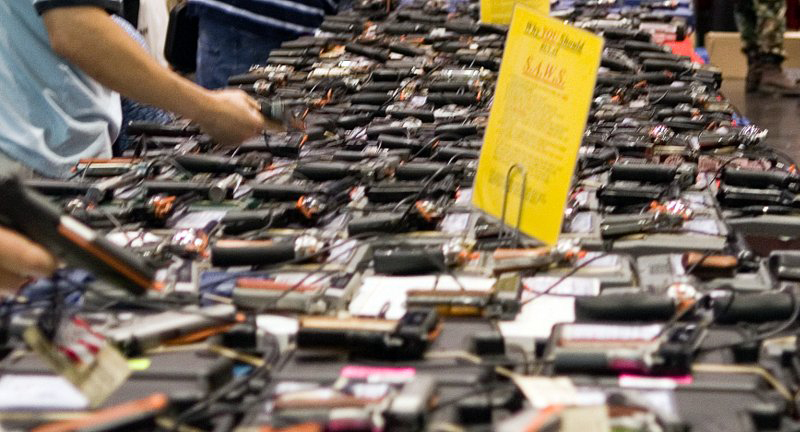 It is likely the lawsuits will fail to increase restrictions on the distribution and ownership laws of firearms in the U.S. Instead, the suit will continue to divert attention away from the central threat of firearms crime; conduct with a firearm, not the technical specifications of the firearm itself. The primary reason the suit will fail to achieve meaningful reform of firearms legislation is a common misunderstanding of firearms nomenclature: The difference between an automatic assault rifle and a semi-automatic sporting rifle. An automatic assault rifle has a mode of operation that enables the user to fire multiple shots with a single depression of the trigger: Pull the trigger back one time and hold it, bullets continue to fire. This is an “automatic weapon”. The sales and distribution of these weapons is restricted in most states to persons holding a specific permit that requires more documentation than other weapons. A semi-automatic sporting rifle has a mode of operation that fires one bullet for one pull of the trigger: Each time the user fires a bullet they must pull the trigger. The sales and distribution of semi-automatic weapons is less restricted than automatic weapons. This distinction should be straightforward. What has created confusion is the appearance of semi-automatic sporting rifles is sometimes nearly identical to fully automatic assault weapons. We have already seen confusion between “semi-automatic” (one trigger pull, one shot) and “fully automatic” (one trigger pull, many shots) among lawmakers. There has been more than one press conference when a lawmaker has brandished a semi-automatic sporting rifle and characterized it as capable of firing “hundreds of bullets” inferring that the semi-automatic rifle they are displaying has fully-automatic capability. It doesn’t. And therein lies the reason why attempts to improve firearms legislation have failed. Confusion may be understandable, although not excusable. Especially among legislators. Semi-automatic sporting rifles like the ones manufactured by Bushmaster look like fully automatic weapons. The irony is they actually store less ammunition internally than more benign looking semi-automatic hunting rifles. Some models of hunting rifles, including semi-automatic and even bolt-action hunting rifles with a less military appearance house their bullets in an internal magazine that is a part of the rifle itself. The Bushmaster semi-automatic sporting rifle (remember, it wasn’t an automatic “assault rifle”) possessed by Adam Lanza at Sandy Hook holds its ammunition in a separate external “magazine” or metal box that is attached to the rifle when loaded. The magazines for these rifles have assorted capacities that can vary with design. In California, the number of bullets these magazines can hold is restricted to a maximum of 10 bullets. The idea is that, a person is forced to reload their rifle after firing a maximum of 11 bullets (remember, the rifle can chamber or contain 1 bullet ready to fire and the 10 in the magazine a maximum of 11, 10+1=11). Presumably this is intended to limit the damage they can do. While many firearms owners and manufacturers argue against firearms legislation reform, their adherence to outdated legislation has continued to polarize their position. Proactive reform of legislation with advocacy from the firearms ownership and manufacturing lobby is a more constructive approach. If the contention of the complaint against Bushmaster is that the rifle Lanza used at Sandy Hook was a combat weapon with automatic capability, then the complaint does not have merit. If the contention is that the Bushmaster rifle used by Lanza is styled after a fully automatic assault weapon, that argument is factually correct. However, it is a difficult argument to prove the styling and appearance of the weapon somehow augment its lethality compared to other semi-automatic sporting weapons. The problem with the Sandy Hook lawsuits is they do not focus on a central problem in mass shootings; management of potentially violent persons who may have a history of behavior that could lead to violence. This suit also fails to address another critical aspect of all gun violence; the responsibility of the owner of the firearm (any firearm) to secure it from use by other parties. This includes the distribution of firearms through negligence by failing to adequately secure them from theft. Interestingly, in the U.S. Army, failure to secure a weapon- any weapon- from theft or loss is one of the most serious offences, comparable to a felony in civilian terms and sometimes cause for less than honorable discharge, tantamount to a felony conviction. Firearms owners argue their rights under legislation drafted well before modern firearms were engineered. The capabilities of firearms have changed significantly since the basis of our current federal firearms laws were drafted. It makes sense that legislation governing the ownership of firearms evolves as the firearms technology does. In nearly every other area of law, legislation has evolved with technology and society, often trailing it, but eventually adapting. Firearms law in the U.S. has somehow been largely excused from this evolution. That is remiss. Furthermore, legislating firearms specifications is an ineffective approach to moderating firearms crime. Instead, improving legislation of firearms ownership liability is a more effective approach. Legislation that would compel firearms owners to secure their weapons or face stiff felony charges, even through their unintentional distribution through theft, need to be imposing enough so that every firearm owner understands the gravity and social responsibility associated with owning a firearm. The beautiful new Boeing 787-8 arriving at Detroit Metro for the first time ever on December 1, 2014 as Royal Jordanian flight 267. The first ever Boeing 787 Dreamliner to land at Detroit Metropolitan Airport arrived this morning, December 1, 2014, Monday. Catching a rare first arrival is a big trophy for aircraft spotters. A month before the arrival of the aircraft, a beautiful, brand new Royal Jordanian Airlines Boeing 787-8 Dreamliner, the Facebook page Detroit Metro Airport Spotting posted an announcement of the first-ever arrival and invited people who “Like” their page to the event. Aircraft spotting is a worldwide hobby among aircraft enthusiasts and bagging a first-ever flight is a rare trophy. Trying to be in the right place at the right time to catch an arriving flight is a little tricky, but much easier now with the help of flight tracking websites like FlightAware.com and networks of people with like interests on social media. The Dreamliner’s route from Amman, Jordan over the Atlantic to Montreal, Quebec, Canada before flying here to Detroit. The Dreamliner arrival originated in Amman, Jordan almost two days earlier and flew in a northern arc across the Atlantic, descending down over northern Canada and into Toronto. It originated as Royal Jordanian Flight 267 out of Amman, continuing from Toronto to Detroit with the same flight number. The Boeing 787 Dreamliner is a milestone in aviation because of its incredible fuel efficiency, over 20% more fuel efficient than similarly sized passenger aircraft. The 787 competes directly with the mostly French-built Airbus A350, and the A350 is said to be even more fuel efficient. From the start the Dreamliner was meant to be revolutionary. Most of the aircraft’s wings are made of carbon fiber, not aluminum. This makes them lighter and stronger, contributing to fuel efficiency. 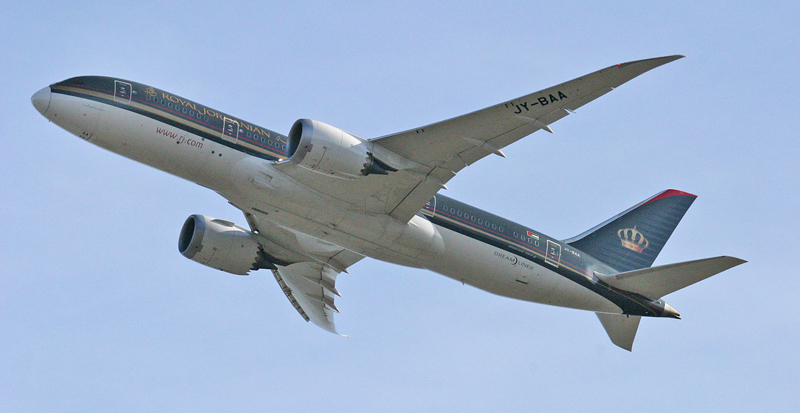 It also gives the Dreamliner its unique upward bowing of the wings in flight, like a giant, gliding bird. The carbon fiber wings of the Boeing 787 Dreamliner form a graceful curve in flight. Here is the Royal Jordanian flight on final into Detroit on its first-ever arrival here. The windows on the Dreamliner use a unique passenger controlled auto-tint feature as opposed to conventional pull-down blinds. Early Dreamliner prototypes had unusual, triangular shaped windows, reminiscent of the DeHavilland Comet. The production versions settled on a squarish, advanced passenger window that is about 30 percent larger than other aircraft in its class. Probably better that Boeing went to the more conventional square windows since the triangular windows that originated with the Comet airliner in 1949 were blamed for several crashes and later changed. 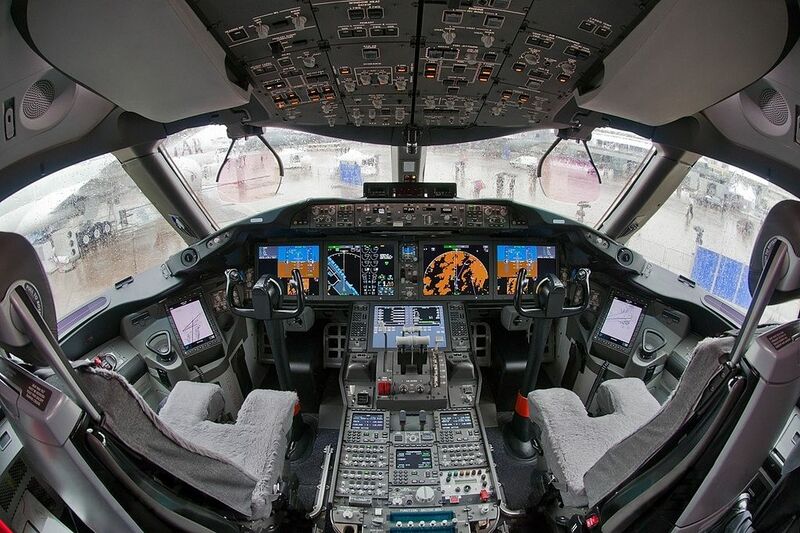 The Dreamliner’s advanced cockpit features full glass display integration, conventional wheel-style flight control column, Heads Up Displays in front of the windscreen unique communications system interfaces. To get photos of the Dreamliner’s arrival I went to the south end of Metro Airport. After driving around the airport and watching flight arrival and departure patterns it was easy to predict which runway the aircraft would likely be arriving on. Early traffic of “heavies”, Bowing 747’s, were arriving on the western runway at Metro, runway 4L as approached from the south. The Dreamliner arrived on runway 3L. Usually the very large aircraft like 747’s are routed onto their own runway while the smaller aircraft use a different runway on busy arrival days. A big Delta Boeing 747 arrives at Metro before the Dreamliner. This aircraft used the farthest west runway, runway 4L as approached from the south. Security around all airports has to be tight. One Tom Clancy novel featured an attack on an airliner using a shoulder-fired surface to air missile at Tucson International airport. In Clancy’s story, the weapon was smuggled across the Mexican border by Middle Eastern terrorists. When I showed up to the south end of Metro Airport wearing a backpack and walking toward the airport fence, three security vehicles and one Wayne County Sheriff converged to stop me. After a quick and courteous ID check by these excellent security officers they let me wait a few moments for the aircraft’s arrival while they stayed with me. A. 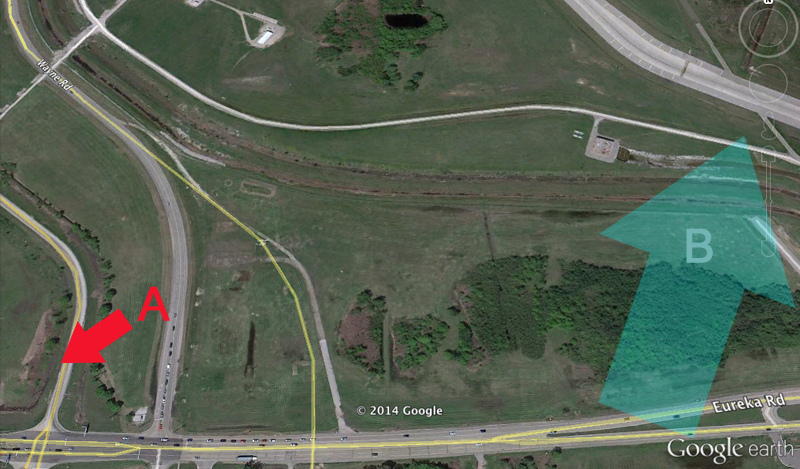 Where I was located to shoot photos between the approaches for runways 4L and 4R. B. The arrival path of the Dreamliner. The ideal location to shoot photos of the Dreamliner would have been with the sun behind me. It was an overcast day so the lighting would be marginal. As luck had it, the aircraft was between the sun and me, backlit. Combined with the overcast skies conditions for photography were poor. But plane spotting is a lot like fishing. Sometimes you hit the jackpot, sometimes conditions are just OK. Today was a “just OK” day for photography. The Dreamliner on final with flaps in the landing position and gear down. The crummy light conditions didn’t do the nice paint scheme any favors. About three hours later the Dreamliner was set for departure and I went back hoping for better light. At the north end of Metro Airport I waited in the hotel/rental car parking lot across I-94 for it to take off. About an hour later than we had thought the aircraft was back in the air, this time with a little better lighting.